Amid the bustling pubs, coffee houses, sushi bars and high-end restaurants downtown, a forgotten piece of Raleigh’s culinary history sits shuttered and forlorn on Wilmington Street. 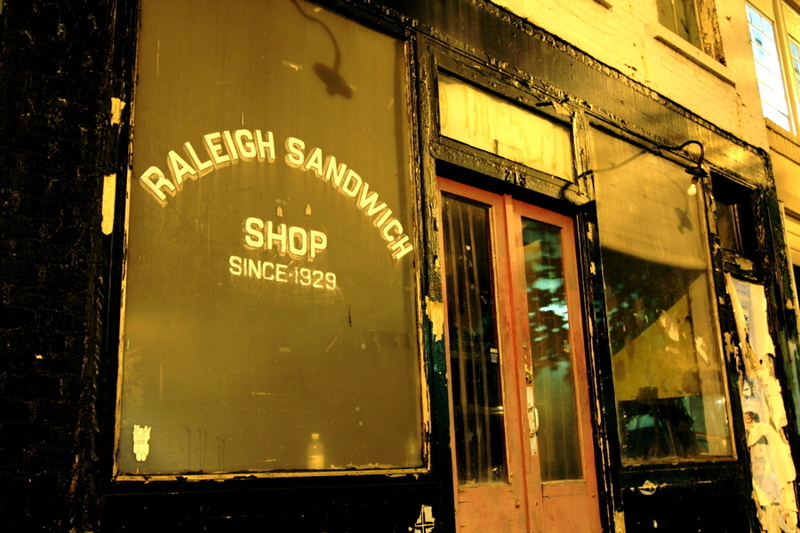 The long-closed Raleigh Sandwich Shop is a relic from an era when family-run grills, luncheonettes and diners were the mainstays of downtown eateries. These small, unpretentious lunch counters were commonplace downtown well into the 1960s. Nowadays only a handful (if that many) are still around. Back in the early 1970s, when I lived in Boylan Heights, I often ate at the Raleigh Sandwich Shop. It was inexpensive and they served plain good food. As I was a vegetarian at the time, I usually ordered a bowl of pinto beans with grilled onions, cheese and a dash of Tobasco to top it all off! I liked the grilled cheese sandwich, too. 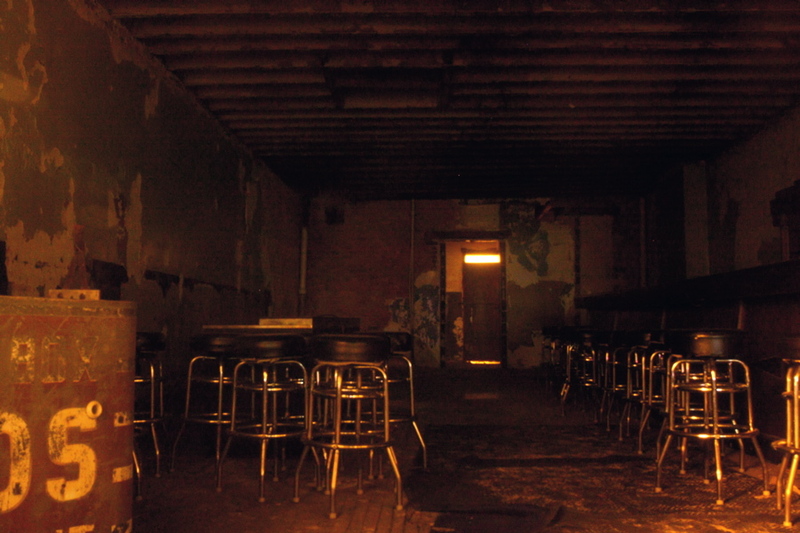 The place was dimly lit, and some would say a little grimy, but it was real — no frou-frou lighting fixtures or pricey wall art here! The clientele was a mixed bag, and it was not unusual to see men in suits rubbing elbows with blue-collar workers. I especially remember the owner, Christ Capetanos, standing behind the old-fashioned lunch counter in his white apron and paper hat. He was a friendly, congenial man, who seemed to have genuine affection for his customers. In 1989, after nearly 40 years behind the lunch counter, Mr. Capetanos retired. And the Raleigh Sandwich Shop closed for good. The N&O profiled Christ Capetanos in its Life Stories series back in April. Turns out he had a very interesting backstory which I never knew about. He was quite a remarkable individual! When [Capetanos] got out [of the army in 1952], he went to work for his brother [John] at the Raleigh Sandwich Shop, a hot dogs, pork chops, cuppa-joe kind of place a block from the State Capitol… At its core, the business was, of course, about food. But there were opportunities for moral stands as well. The restaurant was a de facto meeting place for working-class whites and blacks at a time when the two races didn’t mix in public. There was a partition with blacks and whites on either side, but they shared a jukebox. ‘The cafe was, historically, the only place I know of where blacks and whites ate together in Raleigh,’ said Leon Capetanos, Christ Capetanos’ nephew and John Capetanos’ son… He took comfort in the relationships he formed with his regular customers, in the free meals he quietly gave to people who could not afford to pay. According to the article, a restoration of the building at 215 S. Wilmington St. is underway and “could be completed within a year.” I don’t know about that, but whatever does gets done, I sure hope they keep that iconic sign painted on the storefront’s plate-glass window and the old-fashioned lunch counter inside. It would be a fitting memorial to the man who personified the Raleigh Sandwich Shop. Great post! I walk by the sandwich shop all the time and never got around to learning more about it. It doesn’t look like there is any renovation going on now. I also hope they preserve that great looking sign out front. It is a shame these casual, inexpensive lunch counter type places around downtown are closing often. I think what the business community needs to realize is that this is not because there isn’t a demand for inexpensive casual food in downtown….far from it. But tastes change, and people are eating more healthy than the traditional “greasy spoon diners”. If these casual sandwich shoppes can offer more modern and healthy food (whole wheat bread, vegetarian options, varied flavors, etc) then more of them will survive. I agree RaleighRob! The thing these old time places have that most newer establishments don’t, is ambience and charm. Cooper’s Barbecue, The Mecca and the Roast Grill are good examples. A number of years ago I was in Wilmington and stopped in at the Dixie Grill on Market St. It was a long-time downtown establishment and reminded me very much of the Raleigh Sandwich Shop. On my next trip back to Wilmington I made a point of returning to the Dixie Grill and discovered they had “upgraded” along the lines you describe. At first I was disappointed, but it didn’t take long to realize they had retained the old time essence of the place, much to their credit. I ordered a pimento cheese sandwich– on whole wheat! Great post. Has there already been a post on the Roast Grill? If not, that should be next. Who knows how long that place will be around? Sandwichs are so 1978! Wraps are the future. Those stools, the “photo booth” sign and the bar/counter in the space aren’t original, they’re fixtures for the renovation. From what I hear, it will continue to be a sandwich shop but with better beers (than the 40’s they served before closing) and a better sanitation grade. Dixie Grill might be a good comparison – I hope. And as for missing the casual lunch counters: how about George’s Luncheonette at Cameron Village and the luncheonette in the Cameron Village Post Office. You could get a PB&J and a can of soup and a sweet tea for something like $3.50. And Steelcity36: sandwiches are timeless! Learn how to spell! Thanks for that info REL! I thought those stools didn’t look like the ones I remember: I think the originals were the bolted-to-floor type. And I think I remember the original lunch counter as one of those U-shaped types. But man, that’s been so long ago! I gotta get in there and check it out. I do remember George’s in Cameron Village>> used to go in there a lot. But here’s one for ya: Do you remember George’s in its first location back in the early ’70s, before Cam Vill? 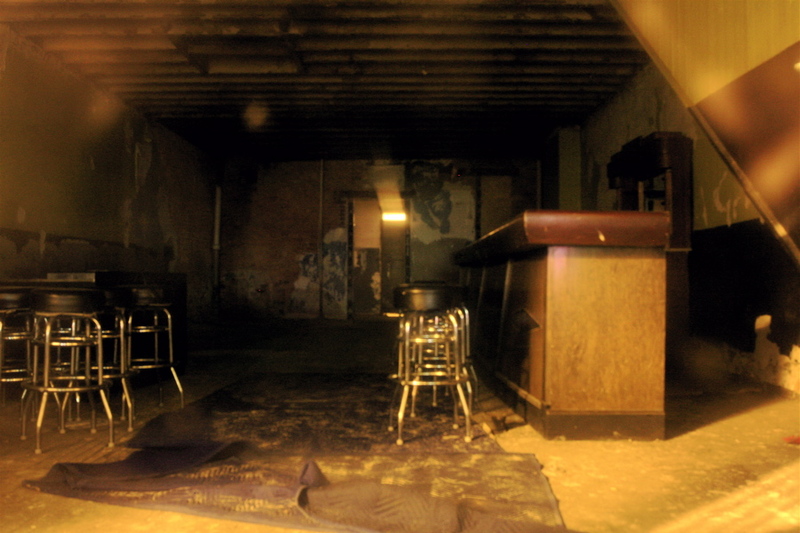 It was on the ground floor of the Odd Fellows Building @ the corner of Hargett + Salisbury! When talking with Shalom (of Isaac’s Menswear) for the article I did last month, he told me what kind of place Wilmington Street in the 80s–often rough and seedy. He said that frequently there were riff raff of various sorts that would wander in to the Sandwich Shop, and Mrs. Capetanos would chase them out in to the street while swinging a baseball bat at them. Evidently she didn’t put up with one ounce of trouble in the shop. I believe Mr. Capetanos often wore a gun while behind the counter and when WRAL began following sanitation grades at restaurants, they reported Raleigh Sandwich getting a C grade because someone poured a bucket of mop water over a strainer full of lettuce in the sink. What a gem in the rough. I hope it gets restored. I ate many hot dogs from the Sandwich Shop in the 60’s. My brother and I spent most Saturday’s in downtown Raleigh, and we always ate lunch there. Who owns the sandwhich shop now? Does anyone know? I have a business partner interested in restoring the property….please let me know. 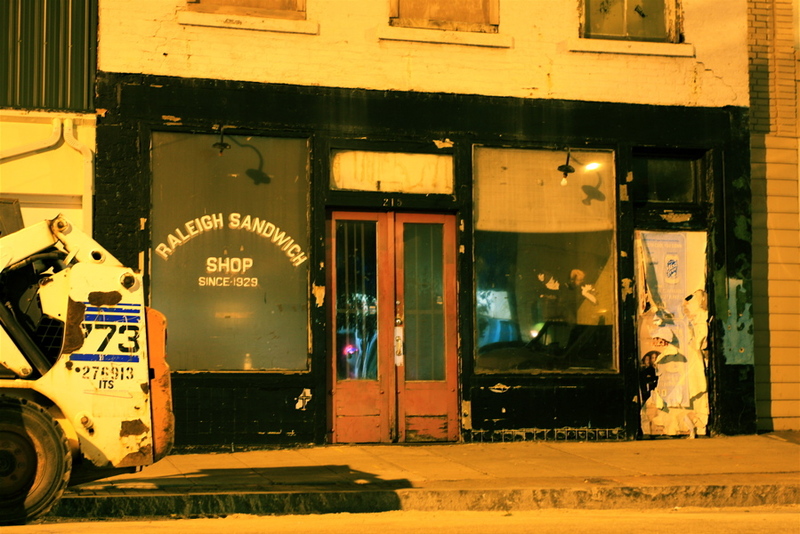 Any new updates on the Raleigh Sandwich Shop building? My mom worked there during the early 50’s – it was known as the City Sandwich Shop then. It was run by the Costas. Ginny Belle — City Sandwich Shop, at 227 S. Wilmington St., was located a few doors down the street from Raleigh Sandwich Shop (215 S. Wilmington). Nowadays Slim’s Downtown Distillery, a music venue and bar, occupies the space. Thanks Raleigh Boy! I couldn’t remember if this was the same spot or not. I just remember the yellow (I’m sure it was supposed to be white but looked yellow to me) – and there was a picture of the Phillip Morris guy on the wall (the one with the tilted hat) – it was an eerie place to a small child. Thanks for sharing your reminiscences of ‘Old Raleigh’ with our readers, Ginny Belle! Glad to have found where the discussion is again. I last posted a few months ago on the “reminiscenses of a Raleigh Boy” location and nothing has shown up since. I was afraid all the discuss had died. Do you all remember the Char-Grill on Hillsborough St.? When we moved from Smokey Hollow during the so-called urban renewal project of the very early sixties, we moved to W. Jones and St. Mary’s St. That was 1961 and that’s when I “discovered” the greatest hamburger/hot dog joint I knew of. I lived two blocks from the North Street Baptist Church where I started going. I met my future husband to be that year. We married in 1964 and just celebrated our 48th this past Aug. We and friends I met in the neighborhood would go to church on Sunday night and then all go to the Char-Grill afterward and stat outside at wooden picnic tables. Some really great times then. Does anyone else have memories of the Char-Grill? Smokey Hollow Girl- I don’t remember the Char Grill when I was very young but I lived on the same street as North Street Baptist when I was about 2 or 3. I remember going to the corner of North St. & Glenwood & getting a cherry smash at the corner drug store. I remember Char Grill was next to the synagogue. Perhaps not the same Char Grill. And definitely not kosher. But a great after-temple feed. Hope Rabbi didn’t see us. I ate a couple of Char Burgers just the other night in my favorite parking spot just as I have for 50 years. The church was replaced with a small condo building sometime back. Jim, thanks for the link to Harrell Sign Company. They posted some cool photos. Al, my husband and I just did the same thing on Sat. 11/10. Still the best hamburgers ever and with great chili, mustard, onions, and slaw too. Yum! It’s basically still the same place today as way back then. I do remember Temple Beth Or too. When I was in high school at Broughton, we took a field trip to the synagogue. One of my classmates was Marty Stillpass, son of the then Rabbi Stillpass. It was beautiful. Someone a few posts back mentioned the Ol’ Raleigh Boys Club. Obviously I wasn’t there but my daughter-in-law’s grandfather, Ryan Bashford and who recently passed away, was a member. Everyone in the family called him Fozzy (as in Fozzy Bear). A few years ago he was going to take my husband to one of the meetings but something came up and my husband couldn’t fit it in. They used to reminisce about the old days and things that happened in the area back then. My husband tells a story of when he was a young adolescent. He had a pet raccoon named Jackson. He lived in the Harrington St. area of Smokey Hollow. There was a bootlegger that lived near him and sold the “white lightning” out of his house. The so-called rich ladies in town would go there to buy their liquer because they didn’t want to be seen by any of their friends at the ABC store. Good well-bred ladies should not be seen anywhere buying liquer so they’d go to the bootlegger since they didn’t expect to be seen. One particular older lady was leaving with her purchases, fully decked out in her jewelry and fur coat. My husband’s pet raccoon happen to just get out of his cage at that moment and go running down the sidewalk. You guessed it, straight toward the fur coated lady. (Did he think it was his long lost mother? Anyway, the lady ran in fright, threw up her hands (liquer and all), screaming “help, there’s a G.D. bear after me, help!” She got in her Mercedes sans her purchases and squealing tires as she fled the scene. Oh, BTW, my husband and I lived for several years smack dab in the middle of the “hurricanes” ares west of Wake Forest. We found remnants of an old still in the back area of our 2.5 acres of property. There was a creek running way back there so the still owner certainly had a lot of cover plus good water to make his mash and end product. Stories go there was so many stills in the area that the “revenooers” had plenty of work to keep them busy blowing them up. That’s why they called the area the “hurricanes” (pronounced hurrikins). I know that A.C. Snow, retired Raleigh Times reporter/editor), has written that he once worked as a “revenooer” and has good stories to tell. Does anyone else have “revenooer” or hurrikins stories? We used to go to Char-Grill late at night after hitting the bars while I was at State, and that little church would be ROCKIN’! NCSU, you are right about that. Shake, Rattle, and Roll! It is so amazing how Raleigh has evolved over my lifetime (and my husband’s) from Smokey Hollow to where we are now. Anyone remember a raggedy old derelict hotel…it had a neon sign “hotel”… red brick, on that side of the road, maybe on on West and Hillsborough? Whenever we passed by, I always thought, there goes the Hotel California, where you check in and never check out. In later years late 1980’s, when I was back in Raleigh, it was condemned, but still there, a creepy old hotel, now gone. It must have had a history. And it was in that same basic neighborhood. I always wondered about it. SHGirl – Thanks for sharing your reminiscences of Smoky Hollow with our GNR readers. Those were different times, indeed. HWGirl – yep, that ‘raggedy old derelict hotel’ was the infamous Hillsboro Hotel, located across the street from the equally infamous Blue Tower Restaurant. The hotel was demolished along with Temple Beth Or and replaced by the present-day condo building in the 1980s. Strange I didn’t notice it was right next to the Temple, but I always walked to services from a friend’s house a few blocks to the north and entered from the west. I notice in the photo there’s a big tree blocking the view from the west. I really didn’t notice the hotel until it was really about to fall down. I assume “infamous” means the usual flophouse, rooms by the hour, drug deals. Definitely an interesting block in Raleigh history. I do remember the restaurant across the street. My friend’s father told us never to go over there. Char Grill was such a treat, that wasn’t a problem. When I was growing up the rumor was that “the East Coast syndicate,” whatever the heck that was, used to operate out of an office in the back of the Blue Tower Restaurant. Heard that from several men about my father’s age – all very hush-hush. Raleigh Boy’s description of the Blue Tower, “equally infamous,” made me think of that. Can anyone shed any light on that little gem? I also remember the Blue Tower and the Toddle House right beside it. Very little space was between them. Whenever we were going to have a lot of company/family getting together at our house, a boy cousin of mine and I would be sent up West St. to the Toddle House to buy a pie for dinner (actually it was called supper then as in breakfast, dinner (not lunch) and supper). I wouldn’t be allowed to go by myself, a male would have to go too, because of the reputation. But, boy, did they have fantastic pies. My grandmother was a master baker(though not professionally trained). Oneof her daughters worked as a hostess in the Hotel Andrew back in the thirties and got Granny the job of baker for the hotel which she was allowed to do at home believe it or not. I sure miss her pineapple cake and latticed cherry pies. When I was very young, back in the last century, my father took me to the Blue Tower for a meal. I do not remember the occassion but trip stands out in my memory for one single reason. While we were eating two oriental men can into the restaurant and ordered a meal. What stands out to me is that they were not speaking English but Chinese, I presume. That is the first time in my life that I was exposed to something/someplace larger than life in Raleigh, a very insular Southern town at that time. It opened a door to a much larger world to me. I know that this sounds a bit silly but at that time in my life the idea of people different from what I saw every day was entirely unfathomable to me. I saw there an inkling that the world was a bigger place than I had previously dreamt of in my philosophy. Hey, give me a break, we only had black and white TV with two channels. What would you expect? If those were the days of b&w tv and two channels ( as I recall, channel 11 was CBS, channel 5 was ABC and NBC. Or maybe the other way around. WUNC was a guy at a chalkboard with a pointer), I’m surprised the two Asian men were seated at the restaurant. They were not, after all, Lilly White. Unless they were kingpins in the East Coast Syndicate. At any rate, your point about a broader world beckoning is well spoken. Do you know who owns the shop now and how one could get in touch with them? my father was partnered with John Captanos and ran the Raleigh Sandwich Shop. I am so surprised and elated that my father’s store is picking up interest. On the exterior it looks like it did back in the 30’s and 40’s when we’d walk there on Saturday mornings with our mother. We lived in Edenton St and would walk by the capital and down Wilmington St to go and have our weekly treat at Daddy’s sandwich shop.We were allowed to have a hot dog and a coke….that was our Saturday treat. Upon entering the shop there was a long counter on the left (for the whites) and another long counter on the right (for the blacks)…in between the two counters were bins that held softdrinks…and you really couldn’t see the people on the other side.Daddy served hot dogs, barbeque and I believe hamburgers. It was our treat for the week.I am just amazed with this site!!!! It’s like going back into my childhood!!! What a surprise! My father,George Evans Thomas and Christ Capetanos were partners and started this business together. George Thomas worked the afternoon shift and John Capetanos worked the morning shift. Chris lived above the restaurant with his wife and son. George after a few years built a home on Whitaker Mill road with his wife, 2 daughters and son. A few years ago my sister and I drove to Raleigh to remember some memories. We were astounded to. See that is was still the same. They made their living selling hot dogs with chilli and barbecue. Delicious!! After John died my father sold to Christ. Wouldn’t it be wonderful if someone was to restore and to keep the antique look. Both George and John werefrom Greece and made a good living. My father George loved this country and always made us remember this. To Leonard and Christ Capetanos I hope you are well. My family is highly insulted that our father,one of the two founders was not acknowledged…god parents of your daughter. What ever happened to the restoration? From all appearances on the outside, it looks like nothing ever came of it. There is so much opportunity here to revive this space! Seeing this thread brought back many memories for me. I too ate hot dogs at the Raleigh Sandwich Shop in the ’50s. Leonard Capetanos was a couple of years ahead of me at NBHS. I never knew that his family ran the sandwich shop. The name and some of the surnames in the thread brought to mind that there were a number of families of Greek heritage in Raleigh. I think it would be very interesting if someone would write up a thread. I know that the Dombalis family were in Raleigh before the 1940s. Mr. Nick, who started and ran the Mecca Cafe for years, immigrated from Greece, I believe. I can count off at least a dozen family names of Greek heritage but I don’t know if there was a Greek Orthodox church (I’m sure there MUST have been) in Raleigh or where it was located. I know several classmates used to attend “Greek School” after attending public school and I assumed it was at their church. Those families made important and lasting contributions to Raleigh and Wake County. Their heritage should be part of this site. Has anyone brought up the topic of BROOKS SKATING RINK/BOWLING complex? I have lived in many states over the years, and Never, Ever, did I find a rink to compare with BROOKS. Used to live for the Wednesday afternoon race competitions, and Saturday night skate dancing with the spotlights and live organ music. Mr. Brooks ran a clean operation and allowed ‘no nonsense’. Don’t remember the name of the organist ‘in-the-box”, which was elevated over the rink. He was ever the professional, and a very talented gentleman. Wasn’t it glassed in? Been a long time since those fifties days, but can still hear, smell and feel the music while whirling around that wooden floor. The wooden spectator seats lined the rink, where parents sat enjoying the dances, and where many a courtship began re the young skaters. BROOKS, as I recall the walk, was located off Peace Street to Brooks Avenue? Forgive me, if I am wrong….but I was always ‘following my nose’ and tagging along with older friends, swinging my ‘bootskates’. old Raleigh community and hope any now living relatives can really be proud of his efforts. Every part of that building was done to perfection and he ran his business that way. I member Brooks Skating Ring quite fondly. It was located 2 blocks down from Peace St. on Tucker St.and ran between St. Mary’s & Boylan Av. You can find some commentary in prior listings re Brooks Skating Rink and Bowling Alley. I made the comments about having to walk home from Lewis Elementary on Glenwood near Peace St. during hurricane Hazel. I was a puny kid in the 2nd grade. We were evacuated from our home on W. Johnson to the shelter which was at Brooks Skating. My 1st bowling experience was also at Brooks. It later became Raleigh office Supply but they had kept the actual floor of both the bowling alley and the skating floor. When Raleigh Office Supply finally closed several years ago, the wood flooring and all the Brooks memorabilia was auctioned off (all of it sold). JT Hobby & Son Inc., a commercial real estate firm, is the current owner of 215 S Wilmington St. It was purchased on 4/25/2012 for $360,000. The President of the company is John F. Holmes Jr.